If you’ve ever looked at the Dragon Age Keep’s artwork and thought, “dang, that would look nice on my wall,” you’re in luck! We’ve teamed up with CanvasPop to bring you high quality, customizable prints of your favorite tiles and tapestries from the Keep. One winner will be chosen by February 29th, 2016. Print a tapestry based on your preferred world state in the Keep or customize the appearance of the CanvasPop print however you like. If you’d like a print based on your personal Dragon Age world state, visit the Keep, load or create your desired world state, and click the “print” button in the upper-right corner. Once you’ve chosen your tapestry, you can customize it further by swapping images in and out. 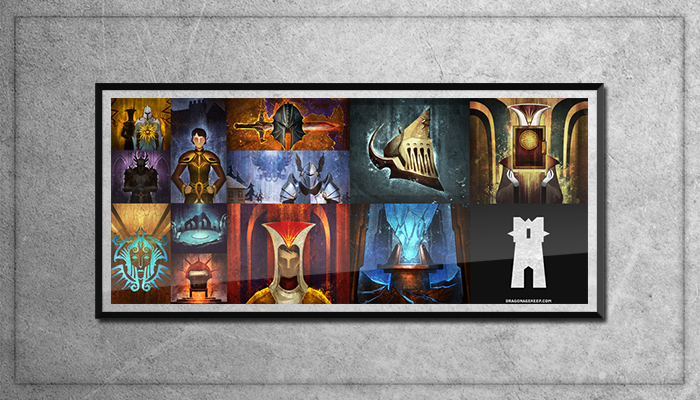 If you would prefer a custom layout of Keep artwork, visit the Dragon Age section of CanvasPop to start fresh—or just scroll up and choose another layout if you’ve already selected a tapestry print. Once you’ve made your purchase, your customized Keep art will be on its way to you in no time. For detailed instructions on how to print a tapestry, see our tutorial. Visit the Keep to print your tapestry or create a custom collage today!